Mapping What You Cannot See, Cannot Know, Cannot Visit : Krulwich Wonders... We live on a planet, next to a star that's part of a galaxy that's part of ... ah, here comes the new discovery. 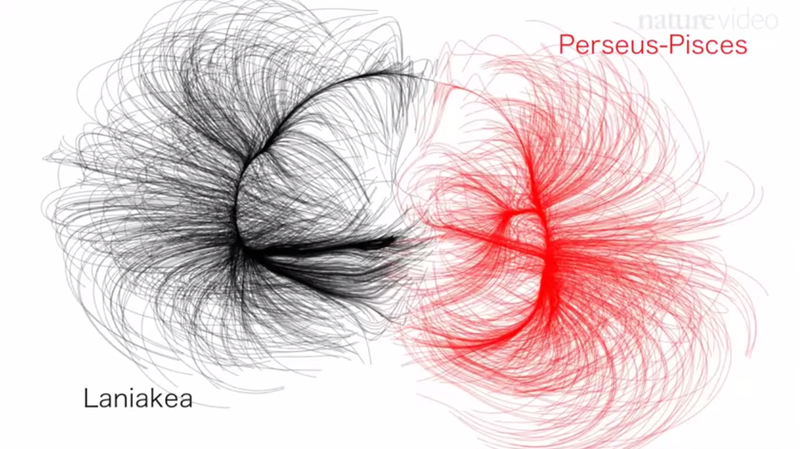 We are at the very tip of a giant galactic "supercluster." Take a look. In 1961 (I was 13), cosmonaut Yuri Gagarin left the planet and got high enough to look down on the real Earth spinning beneath him. He was the first (followed by Alan Shepard and later John Glenn) to gaze with his own eyes on what we had over the centuries so carefully mapped, drawn and imagined. From 160 miles up, you can take in the whole boot of Italy, the Red Sea narrowing to Suez, North America tapering down to the isthmus at Panama, and the amazing thing — amazing to me, anyway — is that what we'd spent 2,000 years drawing in our heads was actually there. We'd gotten it pretty much right! Of course, you say. Cartography is a science. What it describes should be there. And yet, I find myself a little surprised by our ability to measure, to extrapolate, to conjoin, to build a true whole from a gazillion little parts. It's an enormous intellectual feat. And now, I'm happy to report, it's been done again — on a scale that boggles my mind. R. Brent Tully, an astronomer at the University of Hawaii, Manoa, and his team have mapped a hunk of the universe that is 500 million light-years across. It contains 100 million billion suns — including our own little star. 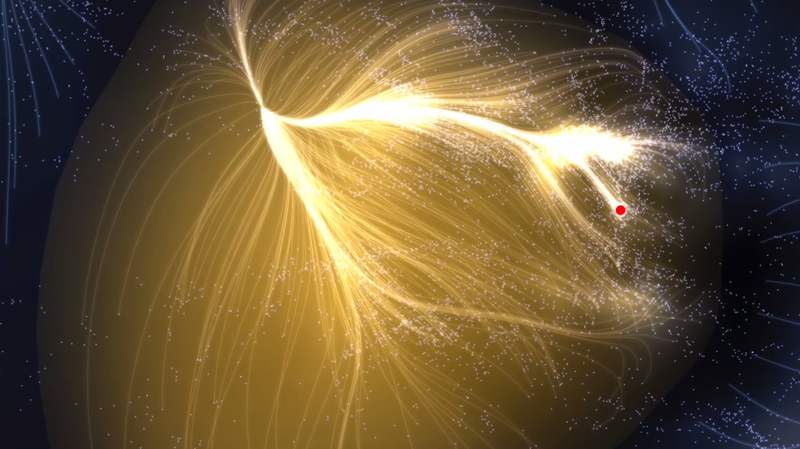 Their new map, like our early Earth maps, is built from detailed observations, intense data crunching and, when assembled, it pictures a galactic neighborhood he calls "Laniakea" — that's a Hawaiian name that the video below translates as (oddly) "immeasurable heaven." But they measured it. What you will see in this video is the first coherent map, not of our Milky Way but of the Milky Way's larger neighborhood, a branching "supercluster" of galaxies, being pulled, pushed and splayed over what I thought would be an unimaginable, unmappable distance — but here it is. As the video will show you, we are at the far, far edge of a long branch of swirling stars, an impossibly small seed dangling from an immense tree of light. Looking at this, I'm reminded that we have been imagining spaces we cannot see for thousands of years. Back in 240 B.C., in ancient Alexandria, an astronomer named Eratosthenes got a letter from southern Egypt. The letter writer commented that where he lived there's a day — the longest day of the year (what we would call the summer solstice) — when a person casts no shadow. None at all. At exactly noon where I live, the southerner wrote, the sun is directly over my head, not a single degree north, south, east or west. For that moment, I am shadowless. Hmm, thought Eratosthenes, that doesn't happen where I live. Here in Alexandria on the longest day of the year at noon, the sun still casts a slight shadow. That got him thinking: What if the Earth is curved? Maybe sunshine is falling straight to Earth, but the shadow I see in Alexandria is telling me that I'm at a different angle to the sun than my friend down south? Maybe these shadow differences are telling us we are living on a giant sphere. He measured the distance between Alexandria and Syene, Egypt, where his friend lived. Then, on the next solstice, he put a stick in the Alexandrian ground, measured the shadow at noon and was able to calculate (using trigonometry, based on the different lengths of shadow) how big the Earth might be. What's amazing is he got very close. He imagined an Earth bigger than the one we live on, but since we don't know how Eratosthenes measured distances exactly, his calculations were either 16 percent too big or just 2 percent too big. Either way, he was conjuring up an immense ball, hundreds of millions of times bigger than he was, and when Yuri Gagarin got to see what Eratosthenes had imagined, it turns out, Eratosthenes was pretty much right. Go figure.